Plug Into Bass Guitar and Play! Plug Vox amPhones straight into your bass guitar and get playing! 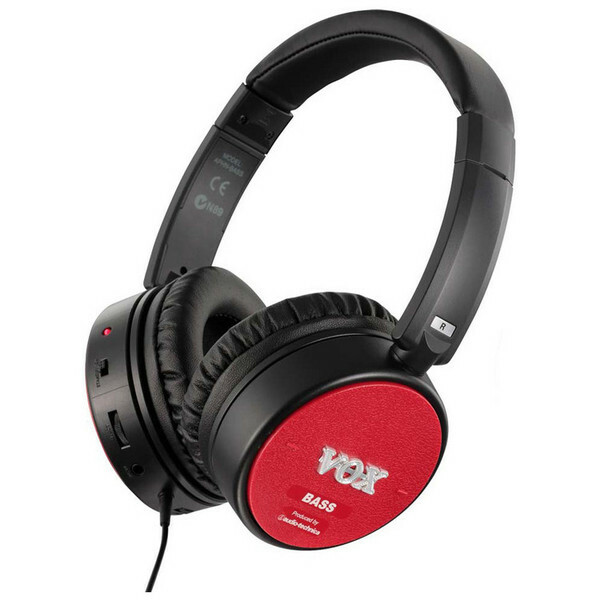 Acting as headphones with VOX's amPlug technology, you can great sound and effects without the need of a practice amp. And unlike the Vox amPlug's, these are the headphones and the amp all in one! The VOX Bass amPhone provides a wide-range sound, including a new Bassilator circuit that realistically simulates the resonance of the speaker cabinet and floor. Imagine being able to play your bass with headphones and without hauling around a practice amp with you. Well thanks to built-in amPlug technology you can get full-fledged bass sound straight from the VOX amPhones. Just plug into your bass with the 1/4" connector and experience great sound! These headphones are made by Audio-Technica who are well known for their quality headphones and microphones. The headphone amp uses a new reactor circuit which is based on the Valve Reactor technology featured in VOX amps, meaning you can get amazingly dynamic amp sounds. The VOX Bass amPhone provides a wide-range sound, including a new Bassilator circuit that realistically simulates the resonance of the speaker cabinet and floor. The Vox Bass amPhones even provides a compressor. You can use the AUX input jack to jam along with your CD/MP3 player. When you're not playing and the power is off, you can use the Bass amPhones as normal headphones with your mp3 player and so on, providing superb sound quality and a comfortable fit, which proves useful for extended listening sessions. The amPhones boast a folding design for easy portability, and the extension cable and adaptor plug are also included, so there's plenty you can get out of these headphones on their own. Weight (without batteries): 230 g / 8.11 oz. A pug adapter "3.5mm <-> 6.3 mm"